There will be at least five dozen performers, from Bono to 50 Cent, in five venues across the world, from Rome's Circus Maximus to the streets of Philadelphia. All will unite behind one simple message for world leaders: end poverty in Africa. Twenty years after he organized the landmark Live Aid concerts, Bob Geldof announced plans Tuesday for the Live 8 concerts. They will take place July 2, just days before leaders of the world's richest countries, the G8, meet in Britain. "We don't want people's money. We want them," Geldof said. Musicians including Madonna, Paul McCartney, U2, Bon Jovi, Brian Wilson, Crosby Stills & Nash, Coldplay, Mariah Carey, Sting, Annie Lennox, Stevie Wonder, Lauryn Hill and Jay-Z will grace stages in London, Philadelphia, Berlin, Paris and Rome. The 1985 Live Aid concerts, held in London and Philadelphia on the same day, sold out both venues. The concerts raised more than $70 million, reports CBS News Correspondent Sheila MacVicar. Live Aid remains the biggest event in music history with one and a half billion television viewers. Since then, Geldof said, Africa has only become poorer. "Twenty years on, it strikes me as being morally repulsive and intellectually absurd that people die of want in a world of surplus," Geldof said. "This is to finally, as much as we can, put a stop to that." Geldof said he had resisted any re-creation of Live Aid, but relented to pressure from U2's Bono and others: "It seemed to me that we could gather again, but this time not for charity but for political justice." The aim of the concerts was to create attention and "political heat" ahead of the G8 meeting to persuade the leaders to agree to cancel Africa's unpayable debts, double aid for the continent and make trade fair, Geldof said. The concerts will be free. Musicians will donate their services, and other costs will be met by corporate sponsors. Venues for the July 2 events include London's Hyde Park, a location near the Brandenburg Gate in Berlin, Circus Maximus in Rome and along Philadelphia's Benjamin Franklin Parkway at the steps of the Philadelphia Museum of Art. Geldof said negotiations for the Paris venue continued. Geldof, who enjoyed modest success fronting the Irish punk band the Boomtown Rats but found fame through the Live Aid appeal, said organizers had "scrambled like crazy to put this together." Elton John, who will perform at the London concert, sat alongside Geldof at the news conference and said he was happy to be part of an event that was drawing the "crème de la crème." "When the Live Aid concert happened 20 years ago I was pretty much a self-obsessed drug addict and, although I was really pleased to be part of a great day, I really wasn't adult enough or mature enough to realize the full consequences of what we were doing," John said. "Now I'm fully aware of what's going on and seeing the injustices going on." Geldof said concertgoers and others will be urged to travel to Edinburgh, Scotland, where he expects a million people to gather for a mass protest as the G8 leaders meet in nearby Gleneagles. He also said he had invited Pope Benedict XVI to join the Edinburgh gathering. "I think he should show up. 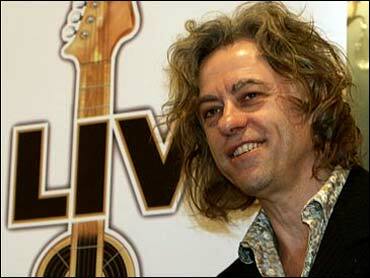 I think it should be his first gig," Geldof said. Fans will enter a lottery by cell phone text message to obtain a ticket. Those performing in London for Live 8 include McCartney, John, Mariah Carey, Coldplay, Dido, Keane, Annie Lennox, Madonna, Muse, the Scissor Sisters, Joss Stone, Stereophonics, Sting, Snoop Dogg, Robbie Williams, U2 and R.E.M. In Philadelphia, acts performing will include Will Smith, the Dave Matthews Band, Bon Jovi, 50 Cent, P. Diddy and Jay-Z as well as Wonder. Among artists scheduled for Berlin: a-ha, Crosby, Stills & Nash, Lauryn Hill and Wilson. The concert in Rome will feature Faith Hill and Duran Duran among others. And in Paris, Jamiroquai, Craig David, Youssou N'Dour and Yannick Noah will be among those taking part.